Wild weather ripped across Roundtop mountain yesterday and early this morning. I awoke to a few flashes of lightning at 4 a.m., and more than a few strong gusts of wind. Those always make me hold my breath until they pass. Yesterday and overnight a hard, cold rain fell, creating streams where none existed the day before. The lane up the mountain was washed out pretty bad, and leaves clogged the washed out areas. This morning the Yellow Breeches Creek ran full, if not over its banks. The wind still gusts and so far shows no sign of waning. The temperature has dropped 20 degrees so far. It is not a day for lounging outdoors. Still, I think I’ve missed the some of the more extreme weather I’ve heard about in other parts of the country that was caused by this storm. For now, the roller coaster that is this season has rolled back into winter. Last night I went outside in my flip flops. This morning I’m wearing my winter jacket. I have no idea whether this latest big dip is the last one or just one more on the ride. Last year winter never arrived. This year it comes and goes from one day to the next. And slams the door in both directions. Ah, the lovely sparkly snow of just yesterday is gone, replaced with a few dull, white patches made occasionally treacherous by puddles and ice. For a few hours, the snow sparkled and twinkled like glitter, like diamonds, like stars on a clear night. It took my breath away. I watched the blanket of snow sparkle in the sun and just stood there, entranced with its loveliness. But now, it's nearly gone already. That seems to be the way of snow in this new climate. It’s gone before you blink, leaving only a memory or an image in a camera. Even though a photograph has always been but a moment in time, not all the captured moments disappear quite so quickly as this snow did. 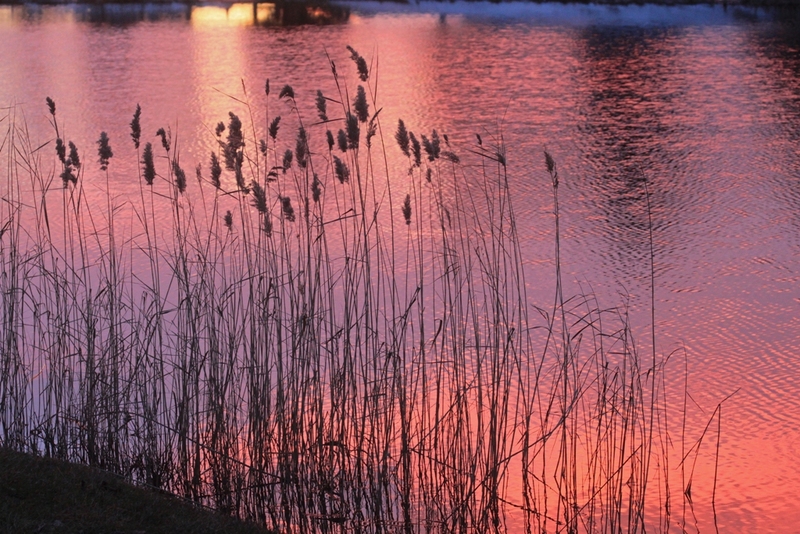 Mountains remain, lakes remain; to short-lived humas only the lighting changes. Sunrises disappear, sunsets disappear but return the next day, different but always there. Snow? I expect that to last for a while, to disappear slowly, a bit at a time, perhaps turning a trifle gray in its last days. 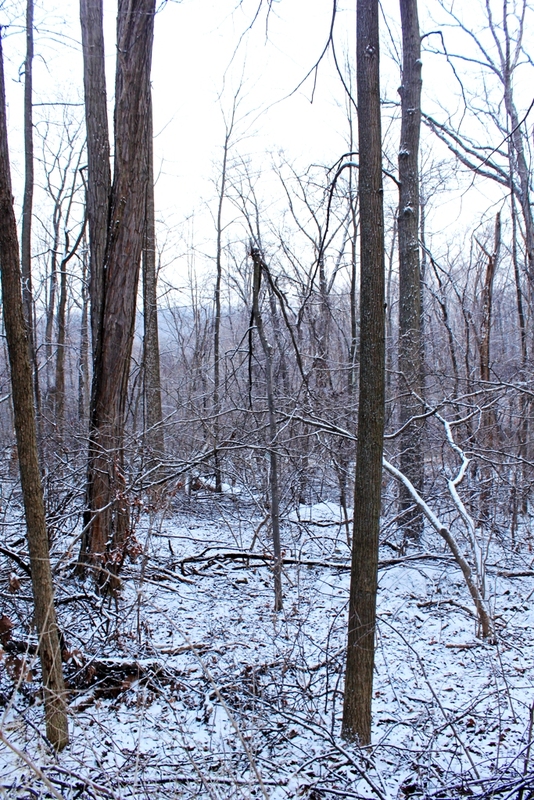 Usually patches of bare earth appear and expand over several days before the snow is overwhelmed by melting. 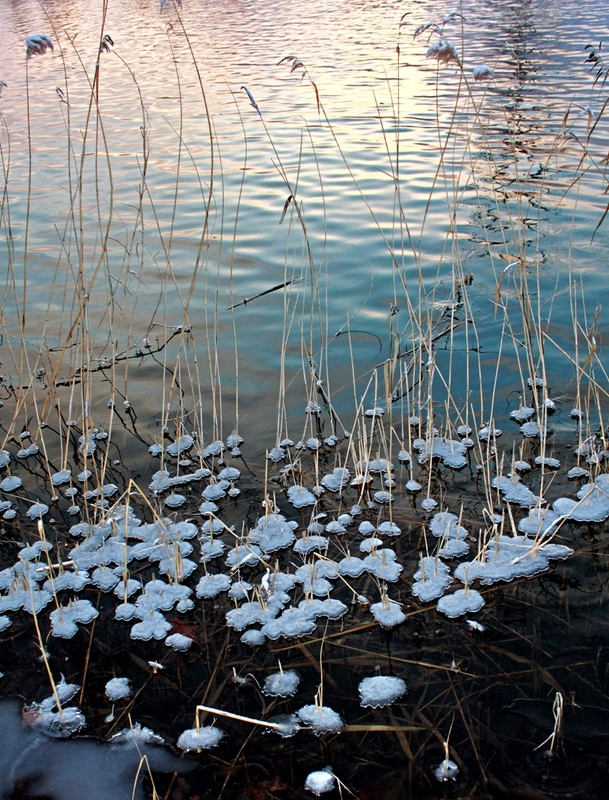 Sometimes snow lasts for weeks, even months. I get used to it, surprised in the spring when a pretty bump turns out to be something I should have thrown away in November. But not this time. the snow is gone, nearly as quickly as a sunrise. About 3 inches of the sparkliest, most powdery snow I’ve ever seen fell on Friday. By Sunday morning, even though the temperature had yet to reach 32 degrees, it was already compressing and perhaps even melting where sun hit it. 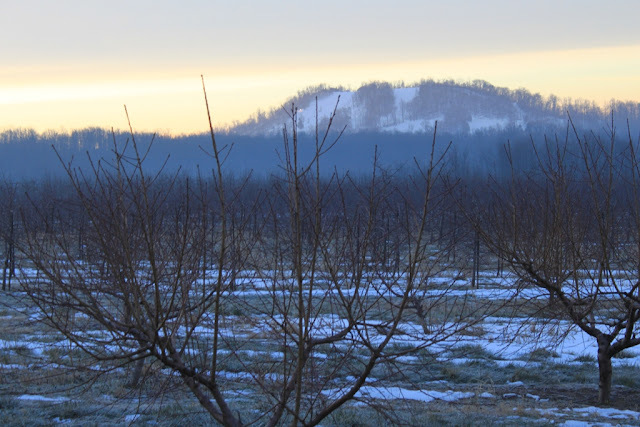 Still, after the overcast cleared, it was hard to argue with how pretty Nell’s Hill to the west looks when it is (almost) covered in snow. Baby Dog and I took a walk through the snow. I was hoping for snowshoe weather, but the snow didn’t provide that. 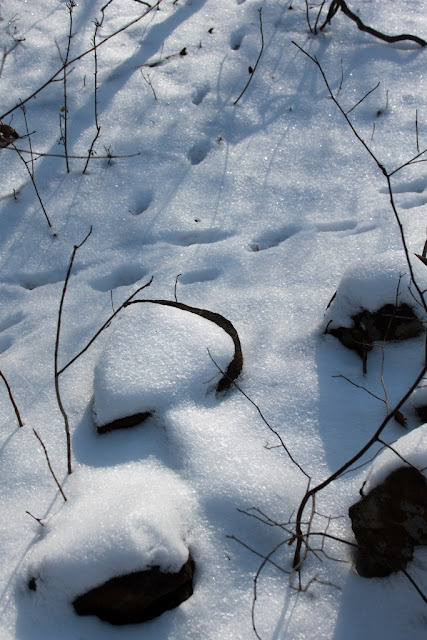 So we just bumbled through the snow, tripping and stumbling over invisible indentations and miniature hillocks. Baby Dog didn’t mind that at all. I was more cautious. I attempted to do a little birding this weekend, but all the ponds and lakes around are now thoroughly iced in. The lakes were filled with a bevy of ice fishermen, but I found no open water for the waterfowl. Birding will be slow for a while until the ice melts. With winters such as they have become, that could be next week, next month or six weeks from now. There’s no telling. So I will enjoy the winter weather while it lasts, but I make no predictions for how long that may be. Snow is coming today. The sky is overcast, the air feels raw (though at 12 degrees it doesn’t take much for it to feel that way). The chill air takes on a dampness that goes bone deep. I can feel that it’s going to snow long before the first flake falls. Last evening, the first signs of snow ahead appeared, in the form of a lovely sunset. The first clouds were just starting to arrive. The best sunsets (or sunrises) always precede a storm. It’s only the storm’s timing the determines whether if will be the sunset or the sunrise that is the pretty one. This morning’s sunrise was invisible; the clouds were already too thick for the sun to penetrate. The storm is already too near for the sun to peek through the clouds. So the sunset provided the glory ahead of the upcoming storm. I wasn’t in the best spot for the best photo of the sunset. I was running the errands I usually do on Friday evening so I can stay home and play in the snow when it arrives. When I rounded a bend on the back road I was driving, there it was. So I had to stop and grab a shot. Fortunately, some back roads around here are still lightly traveled enough that I can do that, even during evening drive times. The deep freeze continues at my cabin on Roundtop Mtn. Yesterday was the coldest morning so far at 5 degrees. That’s the coldest it’s been in two years. Last winter was exceptionally warm, so more than 700 days have passed since I’ve felt cold this deep. It feels odd to me that weather once so common has now become so rare. The cold takes a bit of getting used to, again. My bones didn’t remember the feel of it for a while, though I think that sense memory is back, and both me and my bones have settled into our winter patterns again. I find myself dashing out the front door, covered only by indoor clothes, a hat and my gloves to feed the chickens and give them fresh water. It’s only later that I realize the temperature was in the single digits when I did that. The new chickens aren’t used to the cold and don’t know enough yet to drink their water before it freezes. The old chickens drink whenever fresh water is given them, whether they are thirsty or not. They remember how the water freezes. They know they have to drink while the water is still in liquid form. For the young chickens, winter is still odd and mysterious, a time of frozen water and a cold white covering on the ground. This morning I had a dusting of snow and am likely to add a few inches to the dusting sometime tomorrow. 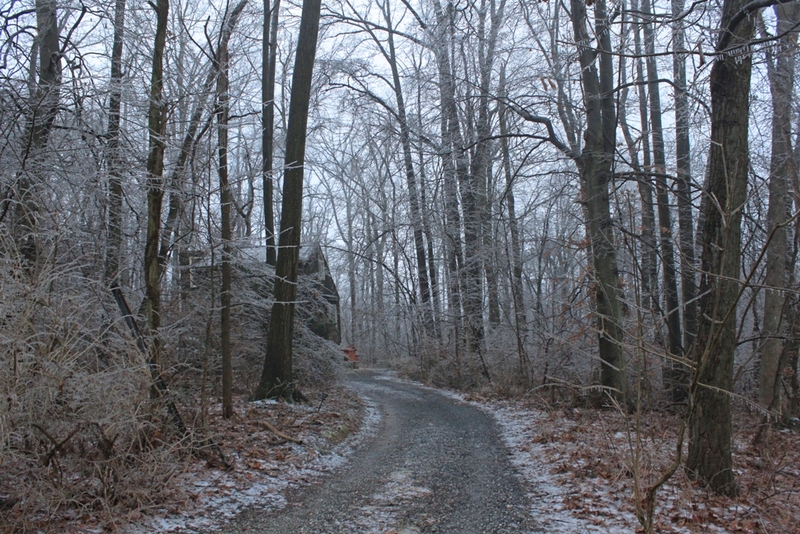 The dusting was dry and crunchy beneath my boots during my pre-dawn walk this morning. For the first time in a few days, the morning walk was enjoyable. The wind was calm, a blessed relief from the days before. Snow makes everything look prettier. 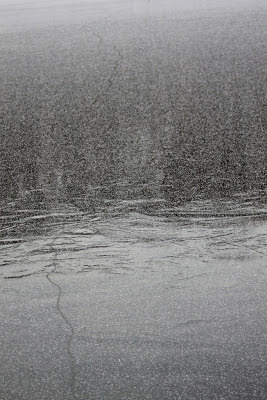 Even at 10 degrees, little ice forms on Roundtop’s snowmaking ponds. They’ve been making snow 24 hours a day since the temperature dropped, and the constant drawing of water from the pond keeps it open. I did find a little ice starting to form around the stalks of last year’s phragmites along the pond’s edge. Winter still feels like a visitor to me, though, rather than a regular seasonal tenant. Here I am more than one third of the way through the season, and this week is only the second week of actual winter weather that’s graced the mountain. It’s harder for me to get used to that notion than it is to get used to the cold. Now this is winter! In fact, I’d be just as happy if that wind wasn’t so strong. This morning I awakened to a temperature of 10 degrees F (that’s -12C, for non-U.S citizens). The overnight forecast was for a balmy 20 degrees, so the weather people really got that one wrong. And the temperature won’t even near the freezing mark again for a solid week. This is the kind of weather that makes it difficult to talk about climate change. Still, I won’t let that stop me. Over the weekend I watched a local show about how warmer weather will affect Pennsylvania and afterward read some Pennsylvania-funded studies about the topic. I was mostly interested in the effects of climate change in practical terms for Pennsylvania by the end of this century. At the moment it appears there are two choices—the best case scenario is that our climate becomes more like Virginia’s is today. The worst case scenario is that we end with Georgia’s climate. The result of either will have a big impact on our state’s agriculture, assuming the state isn’t paved over with macadam by then. Pennsylvania’s famous apples? You can forget about them. Apples like cooler temperatures; they aren’t grown in Georgia for a reason. Pennsylvania’s wine industry? Grapes like cooler temperatures, too. Pennsylvania’s state tree, the eastern hemlock? Ditto. Sweet corn? Ditto. Ski resorts? Forget about them. Snowmobiling? Gone. Some of the state’s most prized hardwood species, such as sugar maple, American beech and black cherry? Gone. The dairy industry? On life support, probably, as heat stresses cows. Changes in bird life are expected from loss of habitat or habitat changes as a result of the warming climate. And there’s more. Winter temperatures are now projected to rise 8 degrees above historic level and summer temperatures are projected to rise 11 degrees. What this means is that the southern half of the state can be expected to endure 70 days a year with temperatures higher than 90 degrees. And in the southern tier cities, up to 24 days in excess of 100 degrees is considered likely, compared with the current 1-2 days. The snow season will essentially disappear, and overall precipitation is projected to rise more than 10 percent. Currently, about ¾’s of the state enjoys at least one inch of snow cover for 30 days in a year. That figure will shrink to about half of the current situation. The picture is not a good one, which is why I have to grit my teeth every time I hear someone exclaim how much better they like this warmer weather. I’m just glad I won’t be around to see the worst of it. How long has it been since the sun was last out? I honestly can’t remember. It feels as though it’s been forever, perhaps fall, since I’ve had a sunny day. Last night I had a bit of snow, just a flurry, but after that came an icy northwest wind that makes a 25F temperature feel like the arctic. Sunrise was still a work in progress when I took this photo, but turkey vultures were already airborne, and not just airborne but high already. I suspect the rain, ice and gloom has not been good for their foraging. They weren’t going to let clearing skies go to waste. Time to get out and about and smell the roadkill! In this area, northwest winds always bring cold and usually drier air. Winter is reappearing here as a result, though still not with the settled kind of depth it should have at this time of year. In another day or so, it will warm up a bit and then the temperature will drop, plummet even, for another few days before moderating yet again. In a normal winter, there should be no moderating at this point, and the cold should take on an endless kind of resonance, not the here today, gone tomorrow impertinence winter is affecting this year. But with January’s average temperature already nearing five degrees above normal here, it’s hard to argue with the appearance of some normal weather, even if its arrival is more of a peek-a-boo game than anything. I knew sleet was starting the moment the first pellets clattered onto my stovepipe. The sound ebbed and flowed as the precipitation changed from sleet to rain to silent snow and back around to all three again. This morning I felt as though I was in that scene from Dr. Zhivago, where Omar Sharif and Julie Christie meet in a ruined mansion where all the furniture is covered with snow and ice. If you ever saw that movie in a theater, instead of on a small home screen, you’ll know the scene I mean. I can still remember the audience gasping at how beautiful that was. The forest dusted with ice is gorgeous but treacherous. The only saving grace from last night’s storm is that the temperature remained near enough to freezing that the ice fell off or broke with little effort. Pennsylvania’s hilly and twisty roads do not make for fun driving on icy roads. And conditions can change from one hill to the next, so it’s never a good idea to think driving is safe just because one spot isn’t as bad as it might be. Just wait until you go around the next curve. This kind of weather brings out the feeder birds at my cabin. They can’t forage when everything is covered with ice, so they arrive at the feeders well before dawn, anxious not to miss whatever handouts they can find. Then they hang around the feeders for much of the day, waiting for something more. Even without the sound on my stovepipe or the waiting birds, by dusk last night I knew a storm wasn’t far off. The field atop the mountain next to Roundtop was filled with 16 deer, all grazing. I often see deer there, but 6-7 is the typical number. With so many there at the same time, it was pretty obvious they needed to fill up while they still could. Once the storm finally clears the mountain, temperatures will return to a winter-time range. Still, the temperature will not drop to the dead-of-winter range where they should be. But it’s better than March. If I have ever lived through a winter that had gloomier weather than this one, I can’t remember it. Truly, those “Twilight” vampires could live here and cavort at high noon without a getting so much as a blister. This morning at 7:30 a.m., I had to wake the chickens up to feed them. My oldest chicken, One-Eye the Pirate, didn’t even come off her perch for a while. It was that dark. 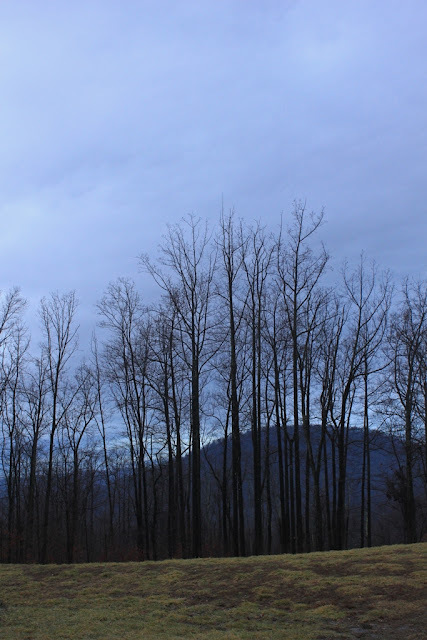 This time of year, the overcast sky means it is too dark to take a photo in the forest before I leave for work. 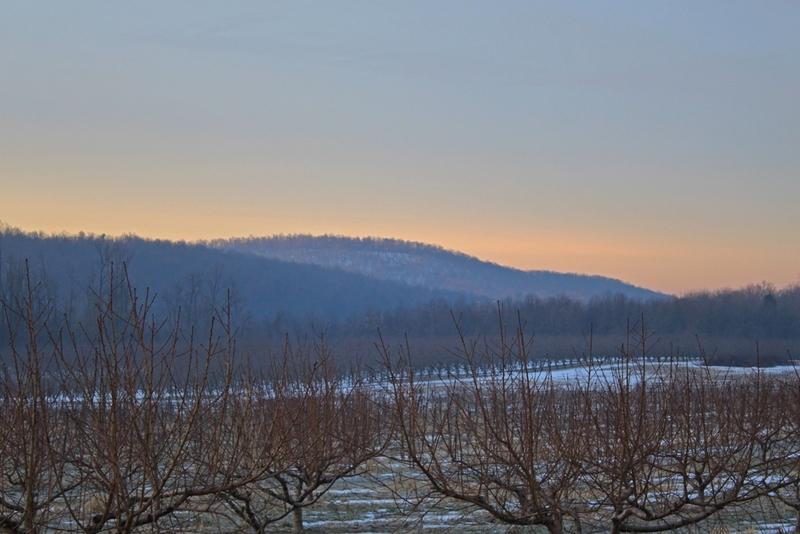 So I head out of the cover of the forest, and usually the open sky over the fields and orchards next to the mountain offers enough light for a photo. Not this morning. 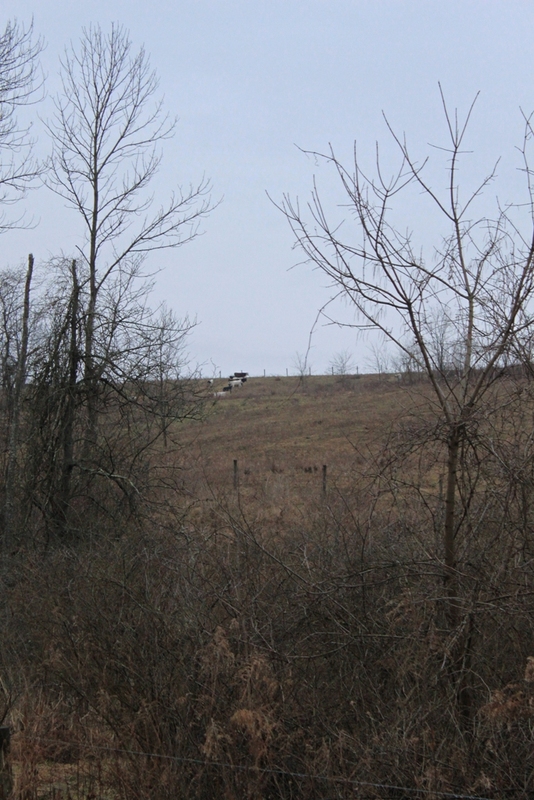 I drove 7 miles and it was 8 a.m. before the sky brightened enough to grab even a dark photo of distant cows. One-Eye isn’t the only avian resident that seems to be affected by the constantly dark skies, though the wild birds seem affected in odd ways. A Carolina wren was singing this morning at 5:30 a.m. under a streetlight at Roundtop, as were a few bluebirds. Meanwhile, a great-horned owl hooted nearby even as I was leaving for work. It’s not every day I hear an owl backed by a chorus of bluebirds and wrens. Even at midday the light is more like dusk than day. The clouds are heavy and dark. Today, the gloom is ahead of a spate of the dreaded “wintry mix” that will fall later. The term simply means that forecasters don’t know what will fall from the sky. In this area, it usually means that every kind of precipitation known to weather will drop, possibly even all at the same time. With a forecast like that, even a few minutes of freezing rain can cause treacherous driving conditions in the morning. Here at work, my colleagues and I are already planning to lug our work laptop computers home so we can work from home if the roads are extremely bad in the morning. That prompted one to remark that the surest way not to get freezing rain is for us all to take the computers home, as the forecasts never amount to much whenever we do this. I can only hope. If the weather had looked this nice over the weekend I would have gone birding. Instead, the fog was so thick that trees just 20 feet away were hazy, and those more than 30 feet away were little more than ghost trees, mere shadows of trees. There was no point in driving to a lake or a river to look for waterfowl, as I couldn’t even see crows in the trees next to the cabin. Of course, this is pretty typical weather for March. Wait, it’s not March, it’s January! The dense fog, perhaps the thickest fog I have ever seen, persisted throughout the entire weekend. 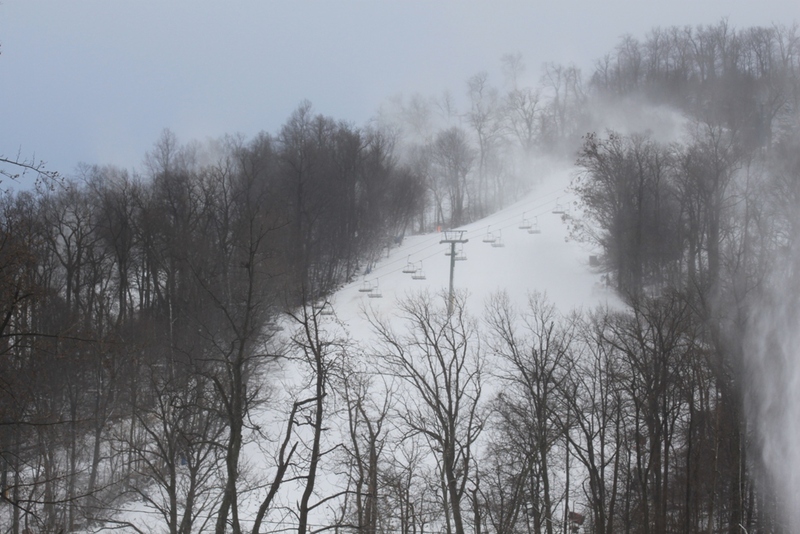 I couldn’t see the bottom of the ski runs when I was right next to them, let alone see the skiers on the hill. This morning the fog was still solidly in place but completely dissipated while I was eating breakfast and about to head out the door to work. Isn’t that how it goes? An entire weekend of gloom as dark as dusk and thick fog, and the moment Monday morning arrives, the weather improves.Of course, it’s still rainy and overcast and far too warm for January, but I can see the neighboring mountain, when I couldn’t even see the end of my deck all weekend long. The only birds I saw this weekend were my regular feeder birds. I heard a few others, but they were lost in the fog. 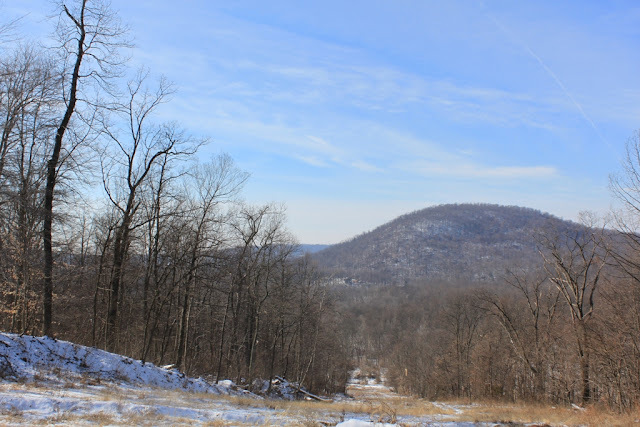 The snow that covered Roundtop as late as Friday evening is now gone. Even the few patches that made it into Saturday are gone now. And I am left with pretty typical March weather, except of course, this is January. Just when I was happily getting used to winter, what happens? Winter takes a breather. Apparently more than one solid week of winter-normal temperatures was more than the season could handle. It has beaten a hasty retreat and leaves me with April showers for the next week. This is not the kind of winter I look forward to. At the cabin, the great-horned owl was calling this morning, so distant I could barely hear it. That probably puts the bird over on the neighboring mountain, which lies across the narrow stream valley created by Beaver Creek. Earlier, in December, a pair were courting vocally very near the cabin. They have gone silent, probably setting up nesting duties and not wanting to alert other predators to where they have established housekeeping. I did find a raptor nest not long after the leaves fell this fall, and I’m going to investigate this weekend to see if they are using that as their home base. The odds are not high that I would find the one place where the big owls are nesting on the mountain, but I can’t resist trying. Years ago I rented a weekend cabin with friends on Hawk Mountain, just down the road from the sanctuary. My bedroom was on the second floor, and across the dirt road from the cabin was a great-horned owl’s nest. I had great views of the downy twins that fledged from that nesting, as my bedroom was just about the same height as the nest. It was like a real life webcam. These days, a brief glimpse of an owl is about as much as I get, and that all too rarely. Most of the time I have to settle for hearing their calls echoing through the forest. 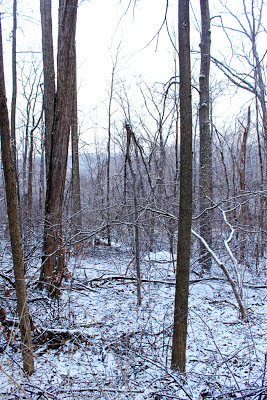 Snow is melting on Roundtop, though I still have more cover at the cabin than here in the foothills. The snow that's left melts during the day and refreezes at night. In some places I have more ice than snow. The slipping is worse now than it was just after the snow fell. It was a pretty morning, though, with less cloud cover than over the past few days. I'm ready for a good walk in the woods, but I prefer to walk in daytime when I can see what's going on around me. For that, I will need to wait for the weekend. Until then, all I have is a glimpse of the woods in front of me. Is a week of winter all that I will see this year? At the moment, winter has left the mountain and something closer to mid-March has arrived. Temperatures are expected to reach the 50’s this weekend, which will certainly put an end to my snow. 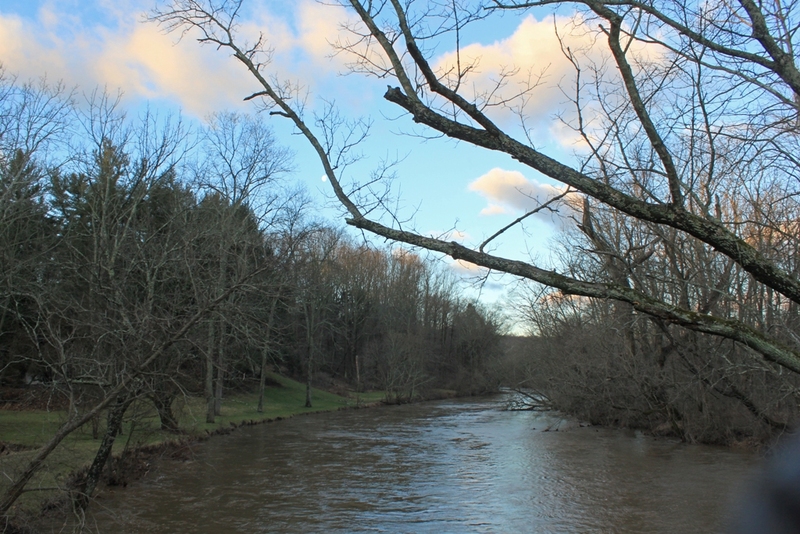 The January thaw is becoming ore like a January spring. It is, of course, much too early in the winter to proclaim the season a bust. At best, however, it will certainly take winter a while to recover from a thaw this extreme. And given the recent history of winters in this area, that may not fully happen at all. Probably to no one’s surprise who has been paying attention, 2012 was the warmest year ever in the U.S. Mainstream media has announced that over several outlets this week, as though it was something new, rather than old news. I suppose it’s worth mentioning that they’ve finally noticed! For a week or so I had hopes this might, after all, be a real winter, though one that started later than it should. Now, I have less hope. It’s still possible , I suppose, but less likely. It will be another full week before the temperatures reach a relatively normal winter range again. By then it will be mid-January, which is normally the coldest point of the winter. My photo today shows the last of the autumn apples, caught for a moment in the rising sun. This one is wrinkled and damaged by frost and time. Why hasn’t a deer found this to munch on? 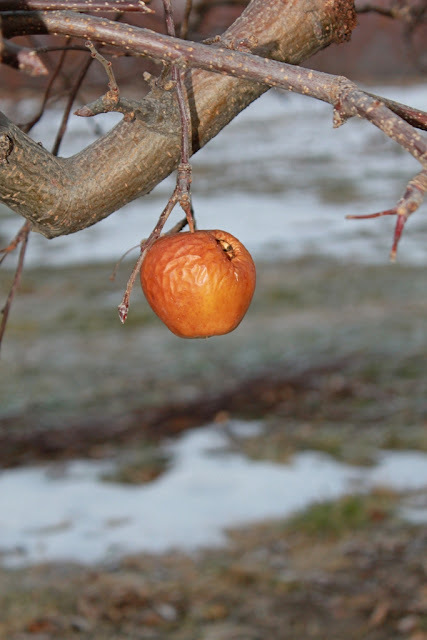 They have enough to feed on elsewhere, I suppose, so for the time being they can ignore apples in a tree along the edge of a road, perhaps having plenty of them deeper in the orchard, perhaps preferring the withered grass that is slowly appearing from under the carpet of snow. 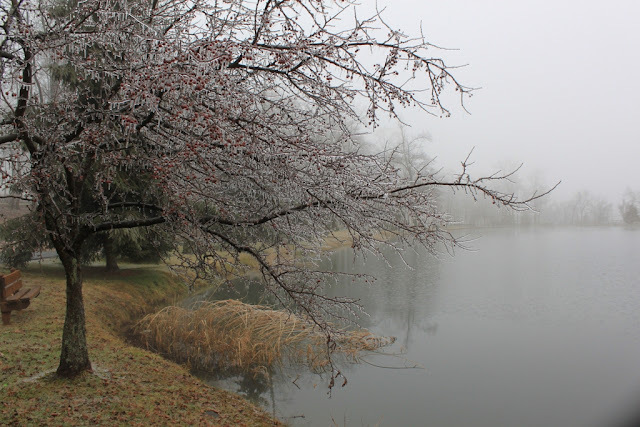 Shades of gray have taken over the landscape on Roundtop and on the nearby lakes. Gray is a typical shade of winter here as many days are overcast. The landscape looks monochromatic, almost, and when a bright color is seen, it draws my eye like a magnet. Where I live, several inches of snow still covers the forest, so it’s a surprise, even a shock, when I leave the mountain in the mornings and find bare ground down in the towns. 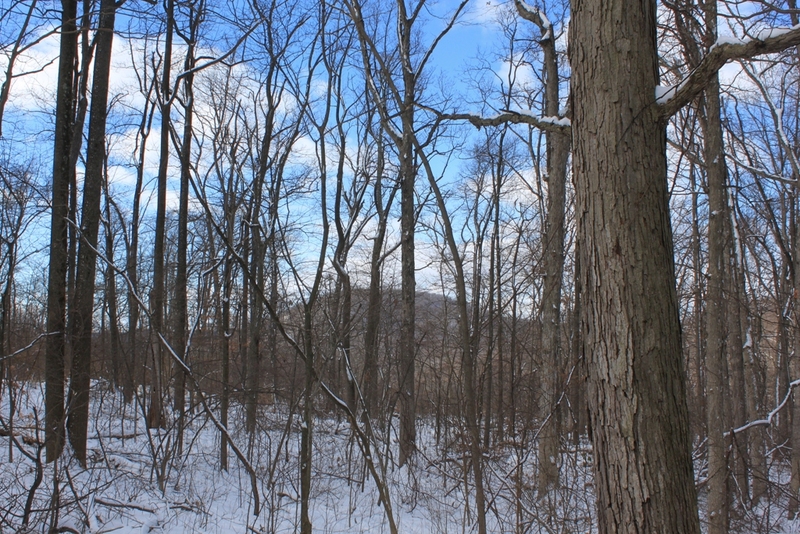 Rural areas are still snow-covered, though I begin to see a few patches of bare earth here and there. 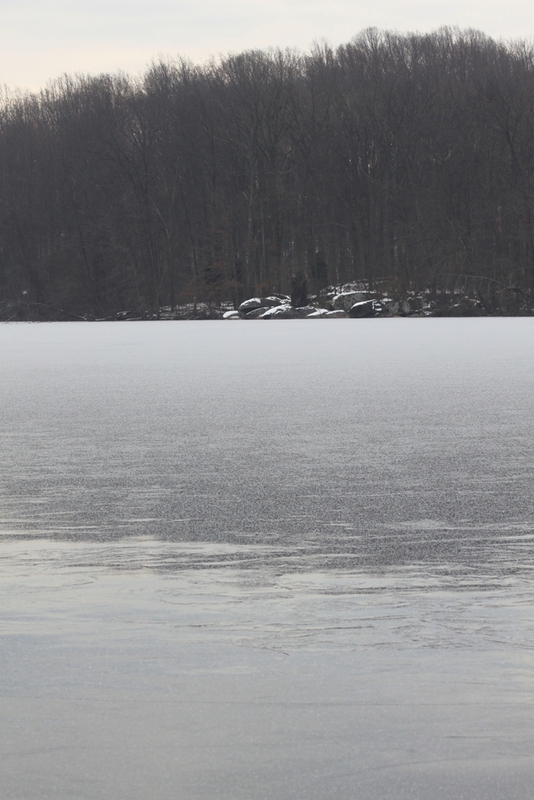 The ice on Pinchot Lake is still clear, clear as glass, even. If this ice were on a road, it would be “black ice.” Black ice isn’t black, of course, it’s simply perfectly clear so that you see the black asphalt underneath. Ice that is clear is ice that doesn’t have air mixed into it, an indication it formed quickly, whether on a lake like Pinchot or the road’s surface. 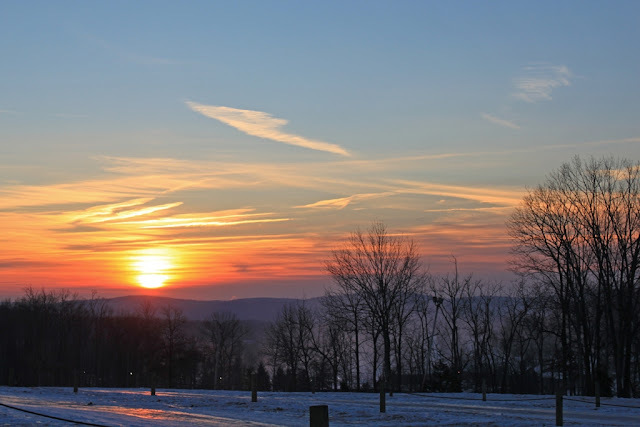 When ice turns opaque or white, air is mixed in, probably from a series of repeated melts and freezes, and if anything is typical in southern Pennsylvania, it’s the winter cycle of freeze and melt. 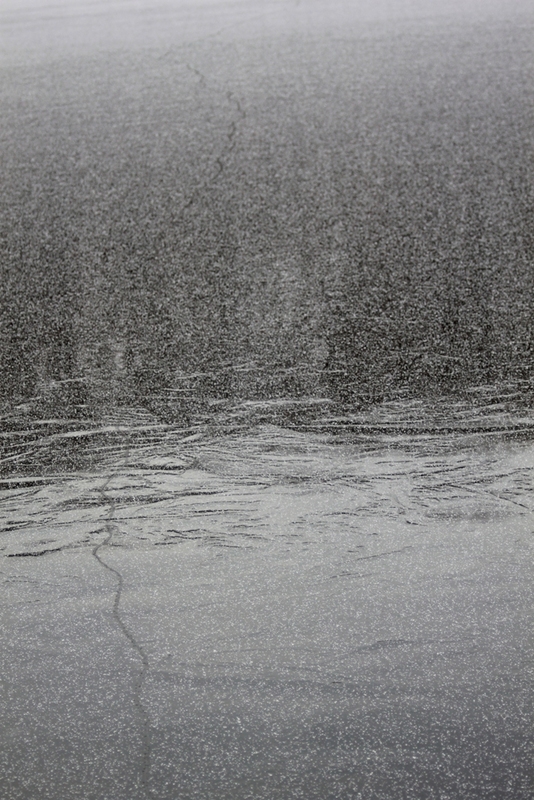 I inched onto the clear ice, cautiously, and stayed near the shoreline. The ice held my weight, but I was uncomfortable, more from the oddity of seeing stones a few feet below me than anything. I'm not used to standing on clear lake ice. It's better when I can't see through to the water just below. Dog refused to do more than place one foot on the ice. He didn't like it either. I soon retreated and rejoined him on the solid ground. 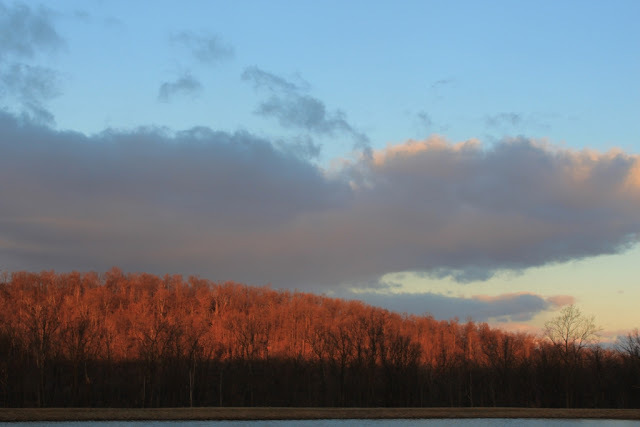 My weekend birding foray to Pinchot State Park was a lackluster one. The lake is now iced in, and though not yet open for winter activities, the ice is already strong enough that I could watch two park employees shuffle across it to place the “thin ice” signs. Because the lake is iced in, my hope of finding some waterfowl was not met, and I was further disheartened by yet another Sunday of overcast skies and gloomy light. However, this morning the overcast sky and the rising sun combined to produce one of those spectacular and all-too-rare glorious natural moments. 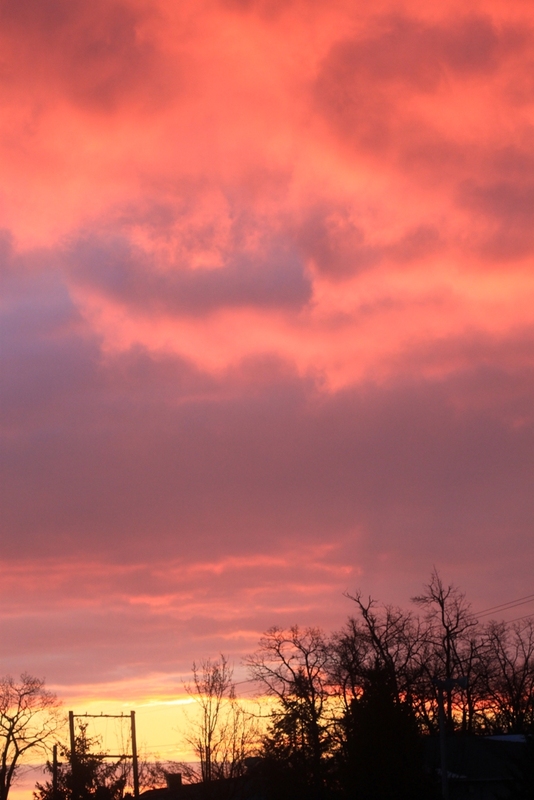 The sunrise this morning more than made up for the previous day’s lack. 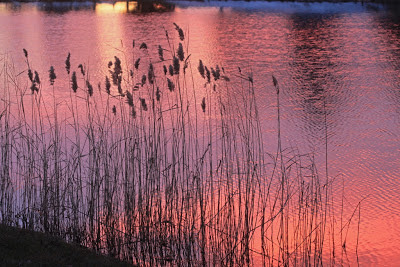 Roundotp’s snowmaking pond stays free of ice—they pump water into and from it so often that ice is rare—and the sunrise reflected on the water and through a patch of sawgrass along the edge. Sunrises don’t get any better than this, and this one was much appreciated on a Monday morning. My birding this January is not resulting in much of interest. I am at a paltry 28 species for the new year. Normally, I can find over 30 species on January 1 alone. This January 1 I managed just 24 species and yesterday added only 4 new species. The cold weather of last week has moved the waterfowl away from here and towards open water—wherever that may be—and yesterday I saw but 1 turkey vulture. Black vultures, a more southern species, have likely decided that Maryland is looking better for them than Pennsylvania is right now. With the exception of juncos, I have yet to find a sparrow in the new year. I haven’t seen a house sparrow or a song sparrow, let alone a white-throated sparrow. None are coming to my feeders at all right now. In other words, my birding year is not off to an auspicious start. I suppose I could say that means it can only get better, but I’m not even sure how likely that is. Maybe next week. At least today I had the sunrise to console me. Tonight is another meteor shower, traditionally a good one, if you are so inclined. The Quadrantids usually put on a good display, and the crystal clear winter nights only aids its visibility. With holidays over and the overabundance of Christmas lights disappearing, even the eastern skies are pretty dark. That does assume you’re not trying to skywatch in the middle of a large town or city, but at least you shouldn’t have to go very far to find a darkened sky. Another sky event is going to occur about February 15 when an asteroid will come within 14,000 miles of earth. That’s even closer than some of our orbiting satellites. It’s not going to hit earth, so don’t worry that the Mayans were only off with their “end of the world” prediction by just a few weeks. This asteroid is reported to be the size of about two train cars—definitely not the kind of thing you want to get hit by. Most of us, apparently, won’t be able to see it, though you might if you have a small telescope. I think I’ll pass on this one. One upcoming sky event you won’t want to miss will start in October 2013. It’s already being touted as “the comet of the century” and a “once in a lifetime light show.” It could outshine the full moon and might even be visible during daylight, but that assumes it doesn’t flame out early. Comet ISON has astronomers cautiously excited, though, and for that crowd, “cautiously excited” is big and maybe even huge. It has the potential to be the brightest comet seen in many generations, so let’s hope that one doesn’t fizzle or burn out early. Comet Pan-STARRS might also put on a decent show in March, but it’s too soon to know how bright that one will be. The good news is that it will be visible throughout most of March, particularly around the middle of the month, and as it’s unlikely to be overcast here for the entire month, at least I’ll have a better chance to see it than I will with the Quadrantids tonight. Only 13 days since solstice but already I can see the difference in the later time of sunset. Although the winter solstice is the longest night and the shortest day overall, the earliest sunset in my area runs from Dec. 4-10, when it happens at 4:41 p.m. Now, in early January, sunset is already at 4:54 p.m. , an improvement of 13 minutes. The overall length of the day itself has grown by just 4 minutes since solstice, because the sunrise time continues to lose a minute or two and won’t start to gain on that side of the day until January 11. I notice the evening improvement because it’s no longer pitch dark when I get home in the evenings. Last night it was still light enough to see that my chickens had safely returned to their pen for the night, without needing to shine a light into the pen to check that they were there. It’s a small improvement but a welcome one. A couple of times when I didn’t have a light handy, I practically had to climb into the pen to check for them. I really prefer when I don’t have to do that. It also means I can see what the local deer have been up to when I get home. Last evening one of them was chomping on my juniper bush as I turned into the driveway, and I came as close to hitting her as I’ve come to hitting any deer in a long time. I didn’t see her until she bolted, and it’s a good thing that happened to be in a section of the drive that wasn’t ice-covered or I wouldn’t have been able to stop. She seemed largely unconcerned about her near miss and was soon chomping on another bush not 20 feet away, oblivious to hearing me talking to the chickens as I put them to bed for the night. I suppose you can say I’m settling into my winter mode of life at the cabin again. I enjoy the routine, so different from summer’s long days and its hot temperatures. Winter has a way of focusing my attention. Daylight is short, and chores and errands both need to be accomplished without distraction. In summer, there always seems to be enough time to put off some chore until “later.” In winter, putting something off means fumbling in the dark or waiting until the next day. I’m relearning, again, not to put things off. I just hope I can learn to keep doing that even after winter is over! Happy perihelion! In case you’ve forgotten or hadn’t thought about it, today is the day when the earth is closest to the sun, proving it’s the earth’s tilt of 23.5% degrees that produces our seasons and not how far we are from the sun. As is my own personal New Year’s Day tradition, I always try to sneak in a little birding around my family’s tradition of gathering for pork roast, sauerkraut and mashed potatoes. This year emphasized a “little” birding that was limited to my own feeders and a brief trip to nearby Pinchot Lake. The number of species I found was low and not helped at all by the overcast sky and flat light. The weather looked as though a freezing rain or a wet snow would fall any second, but it never did. Birds were mostly few and far between, at least where I was looking. Sometimes the light was so poor I couldn’t tell a blue jay from a cardinal, and I gave up trying to identify sparrows. The little devils wouldn’t let me get close enough for a decent look, and the poor light didn’t give me a chance at the distance where they were. But no matter, January is only just getting started, and I should have a good many more chances for brighter days to find a few of the smaller birds. 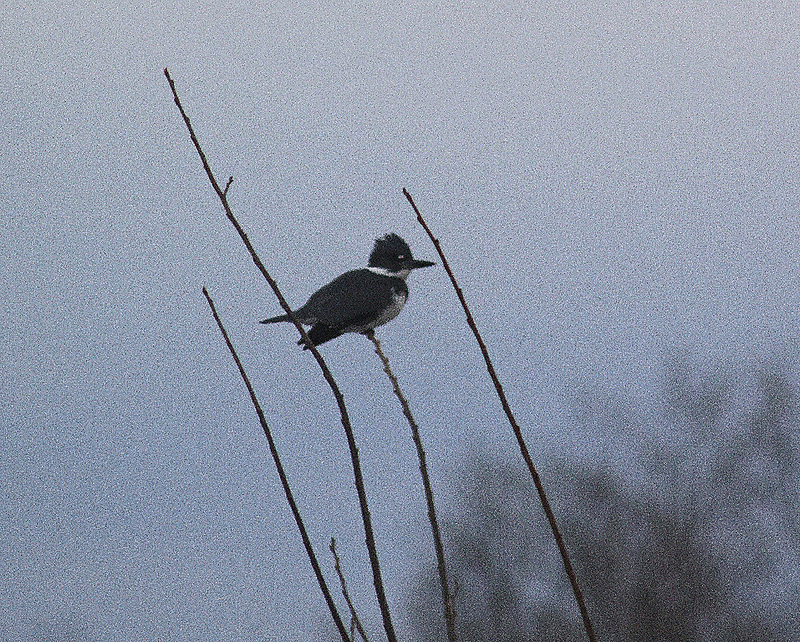 The only photo I took on my mini-expedition was of this distant and too-dark belted kingfisher. Finding a kingfisher on January 1 means that lakes and ponds have open water, as does Pinchot Lake right now. And that open water is a result of December 2012 being 5 degrees warmer than the most recent 30-year normal. In my area, that translates to an average of 38.8 degrees for December, against the normal of 35.43. I have taken to fussing a bit every time I hear a forecaster say a temperature is warmer or colder than “normal.” They rarely explain that their version of normal is only taken from the past 30 years. If you think today’s temperatures are just a bit warmer than normal, you should compare them to the past 70 or 100 years or whatever number of years records are kept in your own area. And I have done that for December in Harrisburg so you can better understand why I’m fussing. In other words the difference between December 2012 and the oldest normal range is 6.1 degrees, even more extreme than the 3.4 degrees calculated using the current “normal” range. I know we're not supposed to think about climate change this locally and that global temperatures have to be looked at. I’m just saying.